To buy one US dollar, we have to now pay more than Rs.72 in India, which was less than Rs.64 even in mid-February this year. 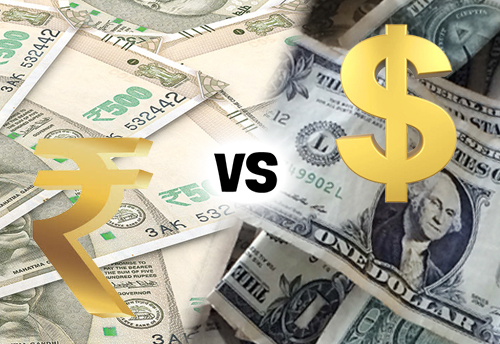 It is synonymous to say that Indian rupee has been weakened vis-à-vis the US dollar. The value of dollar in terms of domestic currency increases when the supply of dollar falls short relative to the demand for it at aggregate level. The supply of dollar comes from exporting commodities and services and through foreign capital inflow from abroad. The demand for dollar accrues from the import demand and for capital outflow outside the country. However, apart from current and capital accounts of balance of payment mentioned above, there is another channel that can influence the aggregate demand and supply of foreign currency in the domestic market. If the central bank wishes to hold more foreign currency than the current stock or if it depletes the foreign currency reserves, for some reason, then also the foreign exchange market would be affected. If the RBI (Reserve Bank of India) decides to sell some dollars in the Indian market in exchange of domestic currency (Rupee), the aggregate supply of dollar would increase relative to the demand and the price of dollar would come down. In other words, the Rupee would become stronger. On the other hand, if it buys some dollar from the domestic market in order to increase the stock of foreign currency, ceteris paribus, the Rupee would be weakened. And, given any stock of foreign currency reserve of the central bank, in case of a trade deficit or capital account deficit, the Rupee would be weaker and vice-versa. If we look at the above graph based on the data provided by the RBI, we see that the exchange rate of rupee per US dollar, depicted by the line diagram, has gone up from less than Rs.64/Dollar in the beginning of this year to more than Rs.72 by mid-September. If we measure the foreign exchange reserve of RBI in billion US dollars along the secondary axis, we see that it has consistently been more than 400 billion dollars throughout this year. It has come down slightly since mid-April, however, it is still at a level of 400 Billion dollars. Now, if the RBI wanted, it could have brought the stock of foreign exchange down and release some dollars in the market in order to stabilise the nominal exchange rate or for stopping the rupee from depreciating further. This 400 billion dollar of foreign exchange reserve is huge – it is more than one seventh of India’s GDP. In the last financial year 2017-18, India’s aggregate trade deficit was 162 Billion US dollars (net capital inflow was 52 billion dollars). Therefore, 400 billion dollar worth of foreign currency reserve is more than comfortable and almost unnecessary. Hence, RBI could easily stabilise the nominal exchange rate, if it wanted. The government intentionally let the exchange rate depreciate. It is not necessarily a bad move. True, the imported inputs and oil becomes more expensive in case of a depreciated rupee, however, the exporters get competitive advantage in the world market. They would be able to sell Rs.64 worth of commodity/services (in the beginning of 2018 the exchange rate was less than Rs.64) at less than one dollar now in the world market or by selling a product worth of 1 US dollar, the exporters would now earn Rs.72 instead of Rs.64. Similarly, importers would be discouraged as the importable would become relatively more expensive than before. Since, the oil and some other essential inputs are relatively inelastic in demand, the cost of production and hence prices would increase. But, some other importable commodity and services would be imported relatively less. As a result of increased export and reduced import, the current account (trade) balance improves and GDP growth enhances. That is the reason why this huge foreign exchange reserve was piled up, by the RBI, at the first place. When there was overall balance of payment surplus, if the RBI would not have increased its stock of foreign currency, the exchange rate would have appreciated. As a result, the trade balance would have worsened and the GDP growth would have been hampered. 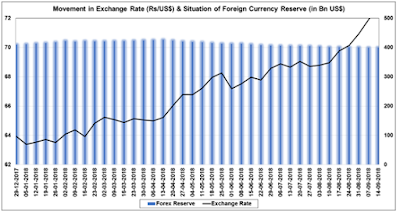 Very fast fluctuations in exchange rate, however, may destabilise the economy, at least in the short-run and hence it is not a welcome situation either. Within a span of just 6-7 months, if the exchange rate fluctuates by 13% or so (from 64 to 72 rupees/dollar), its shock may become unbearable to the economy. Given the relatively inelastic demand for petroleum products, the oil import bill rises in terms of domestic currency, for any given international price of oil, under the exchange rate depreciation. That, in turn, may increase the current account deficit in terms of domestic currency, which would be detrimental for GDP growth. The cost of production of any product, which uses imported inputs (for production and transportation), would rise very fast in case of sharp exchange rate depreciation, which may lead to cost-push inflation. Furthermore, from the point of view of the foreign investors, the net rate of return comes down if the rupee depreciates. For example, if some investment fetches 20% annual rate of return on an average in India, in terms of rupee, and if the rupee depreciates by 20% in a year, then the net rate of return in terms of dollar would be zero for the foreign investors. So, the capital inflow is likely to be affected under sharp depreciation of domestic currency. That would put further pressure on exchange rate itself because of the worsening of the capital account balance. Therefore, the government must step in and make the adjustment process much slower by the central bank intervention in the foreign exchange market. 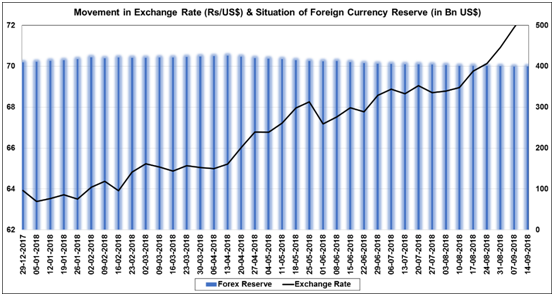 It seems, there was some reduction in the foreign exchange reserve in the recent past, without which the pace of rupee depreciation would have been even faster, under the increasing international price of oil and widening current account (import-export) gap. However, the speed of releasing foreign currency was, clearly, not good enough to stop the rupee from weakening so quickly. Given the foreign currency reserve of 400 thousand million dollars with the RBI, the government could have easily stabilised the rupee vis-à-vis dollar and, under the current situation, it is high time that the RBI releases some dollars from its stock in order to stabilise the exchange rate of Indian rupee vis-à-vis the US Dollar. If, in case, there is a liquidity crunch in the domestic capital market because of siphoning out some domestic currency from circulation in exchange of dollars, the RBI has always the option of buying some government bonds back from the secondary market in exchange of domestic rupee. The commercial banks are anyway holding more government bonds than the statutory requirements. Indirect monetisation would not be inflationary in this case, even according to the monetarists, as the stock of currency in circulation is (not increasing) just being maintained at its previous level.